Yet another great one from the world of Google. The on-going Mobile World Congress 2011 (MWC 2011) flashed in a handset, smartly developed by the Chinese Manufacturer, ZTE Corporation. For those of you looking forward to grab a smartphone this year powered with the Google Android 2.3 Gingerbread Operating System, now have a choice to between the Google Nexus S and the ZTE Skate. Announced at the Mobile World Congress in Barcelona today, the ZTE Skate sports a large, 4.3-inch touch screen, a 800 MHz processor and 5-megapixel photo snapper. 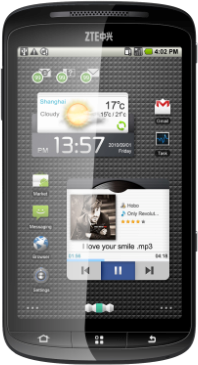 Not much was heard on the company’s newly unveiled smartphone but we are expecting a launch somewhere May 2011.